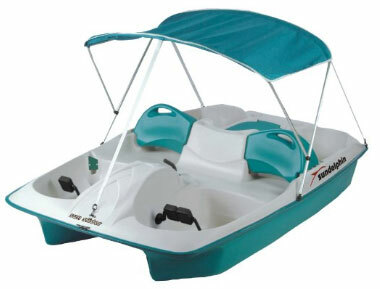 The Sun Dolphin Sun Slider 5-seat pedal boat with a canopy seats up to 5 people with fully adjustable seat backs and provides added comfort and protection with a durable canopy. Built-in coolers allow you bring along your favorite beverage or act as storage areas to hold extra gear. The boat is constructed with a rugged, UV-stabilized Fortiflex® polyethylene deck and hull, an aluminum tiller steering system and a tough paddle wheel. > Seats 3 people in the front and 2 in the back; removable high-back supports > 3-position pedal cranks, with tiller steering system and tough paddle wheel > Built-in coolers for storing food and beverages; recessed drink holders > Fishing pole holders for fishing with ease. > Integrated motor mount; measures 93 x 24.5 x 65 inches (W x H x D) > Length: 93", Width: 65", Height: 24.5", Weight: 110 lbs., Capacity: 825 lbs.